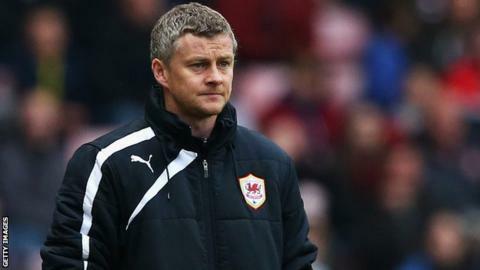 Cardiff City escaping Premier League relegation would be "a bigger miracle" than Manchester United winning the 1999 Champions League, says manager Ole Gunnar Solskjaer. Teddy Sheringham and Solskjaer scored in injury time as United famously beat Bayern Munich 2-1 in Barcelona. Cardiff are bottom of the league ahead of Saturday's trip to Newcastle. "If we stay up it would definitely be a bigger miracle than Barcelona in 1999," said Solskjaer. "That night it was possible, and in football anything is possible." The Norwegian wants his side to keep their survival hopes alive for their final game of the season, against title-contenders Chelsea at Cardiff City Stadium on Sunday, 11 May. Other results need to go Cardiff's way for them to survive over the season's final two weekends. "We need to give ourselves a chance in front of our fans against Chelsea," the manager added. "It takes belief, togetherness, a team that goes the extra mile, and a hero stepping forward and doing something magical. "It's still possible - it's still possible that we are out of the bottom three if we win this weekend. "One of the key points is just imagine how this place [Cardiff City Stadium] will be next weekend if we have got something to play for - when we have got something to play for. "Let's give ourselves a chance by beating Newcastle, because this place will be absolutely rocking if we are in with a chance." Cardiff must recover from a 4-0 hammering at Sunderland last weekend at St James' Park and then go on to limit Solskjaer's experience of relegation to a single event. "It was with my local team [in Norway]," he said. "I think I scored two thirds of our goals that season. It's the only relegation I have had. "But you can't compare that. I was just playing for my local team. I was 21. I never thought I would play football for anything else but enjoyment. "Here, you can see how much it means for your players, your fans, for so many more than just yourself and your little town if you play in the second or third division back home. "Here, you have got a much bigger responsibility, and that's my job now. This is a fantastic club. We are going into this game to give ourselves a chance to stay up." Newcastle hope to halt a run of six successive league defeats that has put boss Alan Pardew under pressure but recent events at St James' Park are of no concern to Solskjaer. "I will let Alan deal with his problems, and I will control my issues," said Solskjaer. "I am not one of those who talks too much about the opposition. "We need something special. We have to go there and defend well against the likes of [Moussa] Sissoko, [Loic] Remy and [Shola] Ameobi, but we've got to do to them what they do to us."